FBM or Feature Based Machining Milling and Drilling is introduced in MastercamX3,”I looked my boss straight in the eyes and said: FBM is the feature that is going to make you fire me, and hire my 7 year old.” Alright who are we kidding, but that is the direction CAD and CAD/CAM software are going these days. FBM is going to be introduced into Solidworks ( I saw it with my own eyes at Eastec in the spring of 2008). So Looking a little deeper into FBM Milling this week, I realized that some of the info that have been circulating ain’t really the skinny, imagine that in the CAD world, ridiculous, but thats there thing, right? So FBM is the new “high-tech” thing from Mastercam, you plug your Solid model in the software, and you hear a “beep” and looking into your machining center……..there is your finished product. Almost, FBM analyzes the solid model, look at what tools and parameter that the user has defined, and from there pick the appropriate toolpath. WAIT, in MastercamX3 FBM can only use those new 2D Highspeed toolpath (Part3) what makes it pretty useless in the mold industry what has always been Mastercams strong hold. 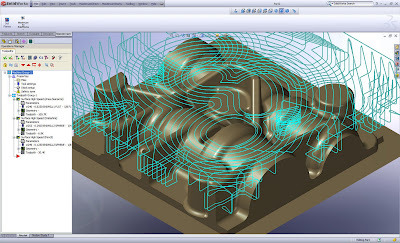 My reliable intelligent source (who told me this is privileged information….shhhh) said that when Mastercam inside Solidworks comes out in the begining of 2009(Privileged info), the 2D highspeed toolpath will be replaced with new 3D highspeed toolpath(Privileged info). I know we all feel better now don’t we? Go =>Toolpaths=>FBM Mill…. And I must say that the menus throughout FBM has a very nice clean look to them. FBM Drilling is the sister to the mill side, the menus has the same clean look. After having playing with it for a little while, I do realize that it could have a place in MastercamX3, at this point it seems to be pretty much in development, I would maybe trust it to be a quick way to dispose some material in a big Mold cavity, while the programmer gets surfaces and semi-finish toolpaths ready. FBM in Solidworks…….well off course we 1st. need to see those 3D highspeed toolpaths, but also I am a little leery if this is going to be the only options in Solidworks, sometime you just need an endmill to follow a simple “sketch” line, using a old fashion contour toolpath. Not the last time the words “Feature Based Machining” is going to be typed on this blog. This entry was posted on Monday, September 1st, 2008 at 2:19 pm	and is filed under Uncategorized. You can follow any comments to this entry through the RSS 2.0 feed. You can leave a comment, or trackback.